In this style the swimmer is on his chest and the torso does not rotate. It is the most popular recreational style due to the head being out of the water a large portion of the time, and that it can be done comfortably at slow speeds. Cup your hands and push water to lift your head to breathe. Make a V-shape with your legs like a frog as in the video. Point your tows as you bring your legs together while pushing the water. Often beginners end up moving their hands and feet simultaneously instead of moving them alternatively. While this keeps you afloat and moving forward, it exhausts you sooner and is not the proper technique. 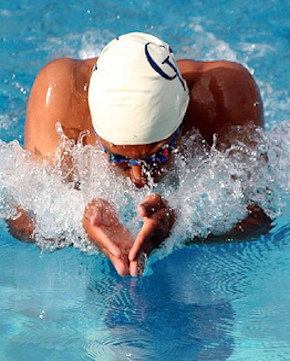 To achieve a proper technique of Breaststroke, practice as much as you can with drills.